A monthly Welsh-language music periodical that was intended for use in tonic sol-fa lessons. The periodical's main contents were compositions and articles on music and musicians alongside news for tonic sol-fa classes. The periodical was edited by the musician, John Roberts (Ieuan Gwyllt, 1822-1877), except between April and June 1869 when the musician Eleazer Roberts (1825-1912) was editor. 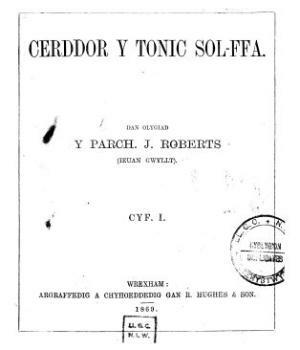 Associated titles: Cerddor Sol-ffa (1881).